In a time when just getting out of the house was an effort, those attending "Evening Prayers" at the country church show the value of community and faith on cold winter nights such as this. 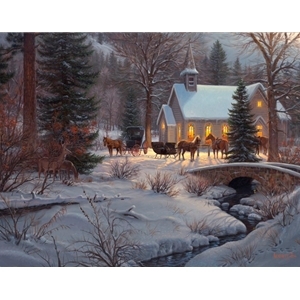 Mark Keathley captures the heritage of America in this timeless dipiction of the faithful few gathered to lift up their concerns and petitions. The surrounding country side is covered in a blanket of snow but the warmth of fellowship glows from within like only good company and hope can produce.